So, you have an invitation from a good friend to join a direct-selling business! You were probably promised big income potential, leveraging on others' efforts, time and financial freedom and amazing products to sell. But then again, if what's being promised is too good to be true. I suggest doing in-depth research about the company, before signing-on the dotted line and using your hard-earned money to purchase their products. 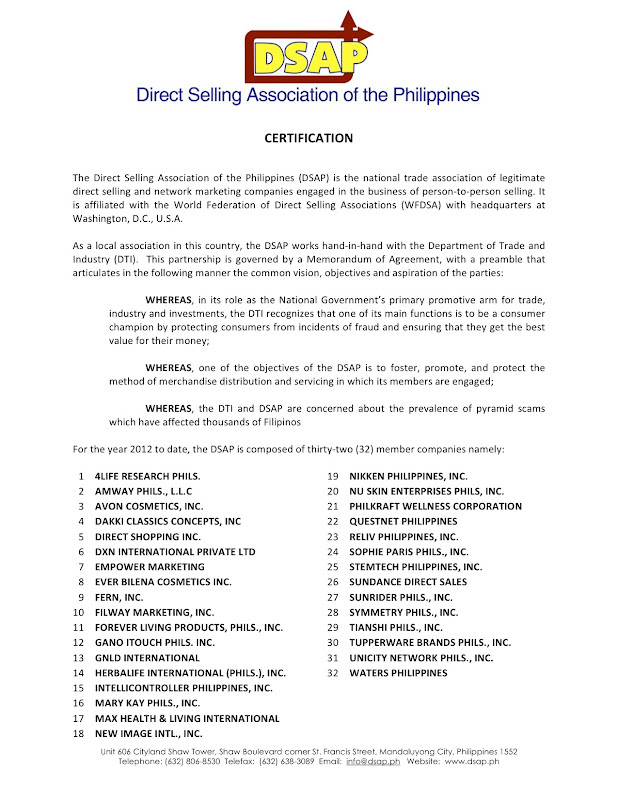 The most credible resource on network marketing and direct-selling business is the Direct-Selling Association of the Philippines. Formed in the late 1970s, they are the self-regulating association composed of direct selling companies here in the Philippines. The Direct Selling Association is part of the umbrella of the World Federation of Direct Selling Association based in Washington D.C. USA. Recently, they released a list of their active members. So, if you're being lured by a company who is not in their roster of members, I urge you to think twice. There are only 32 active association members. Check out why your prospective company is not in the list. Could it be that they are not up the ethics and professionalism standards of the direct selling industry. Or worse, they could be a pyramiding scheme. If the answer to all the questions is YES, then the company being evaluated is a legitimate company. But if the answer is NO, then there is a high probability that it is a pyramid scam. Nu Skin Enterprises Philippines has always been an active member of DSAP. A number of their outstanding distributors are even asked to conduct trainings for them. Recently, the DSAP has been actively promoting the industry in universities, with a 2-day course in Direct Selling and Network Marketing. The aim to expose the public to legitimate direct selling and counteract some negative impression, eventually encouraging people to make it as a career. If you are interested to know more about direct selling or Nu Skin Enterprises Philippines, you can drop by their office at 15th floor Octagon Building, San Miguel Avenue, Pasig City, Philippines, with telephone numbers 632-8-NUSKIN. 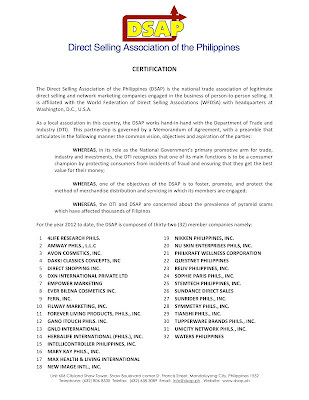 As of Oct. 2104, how many direct selling companies are present in the Philippines? Thank you!